Daniel Clocker�s life is a good example of how a poor indentured servant could take advantage of the opportunities in America to improve his position in society. Daniel was probably born in Cumberland County in northern England, but he chose to come to America to seek his fortune. In England, population was growing and jobs were scarce, so he may have felt the New World offered more opportunity for a young man willing to work. Or, perhaps he was seeking adventure. After all, he was only seventeen, old enough to want to be out on his own but still a teenager with hopes and dreams. Unlike sons of wealthy families who went to college in England, Daniel was not well-educated. He could not write his name and probably could not read. 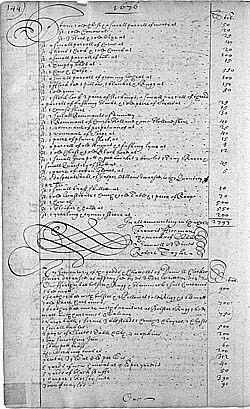 When he came to Maryland in 1636, he could not afford to pay for his passage across the Atlantic Ocean, so he became an indentured servant, agreeing to work for a master for four years. His master was Thomas Cornwallis, a very wealthy man and one of the leaders of the colony. Most likely Daniel was put to work growing tobacco, the colony�s main crop, or else building a fort or temporary houses to protect and shelter the new settlers. Life was not easy, as most servants had to work hard for long hours. Some masters would even beat their servants or not give them enough food. A servant could be sold without his consent too, so life was very uncertain. In the early years of the colony, perhaps 20-30% of the immigrants died from disease, and the average man lived only 43 years. However, if an immigrant survived his servitude, like Daniel Clocker did, he possessed a good chance of becoming a successful member of the community. After serving his time, Daniel married Mary Lawne Courtney, who had also been a servant. Mary was a widow with a young son. Both because women were scarce in Maryland and because it could be difficult for a woman to survive on her own unless she was rich, it was not unusual for a woman to remarry. Daniel seems to have worked as a carpenter, while his wife Mary served as the local midwife and also worked as a dairy maid. Sometimes she would sell butter or cheese to her neighbors to help support the family. Daniel managed to acquire 150 acres of land, plus a small plot of land in town where he probably built a house. He was becoming a respected member of the community. In 1655 Daniel was appointed Justice of the Peace for St. Mary's County and later he served as a member of the common council of St. Mary's City. 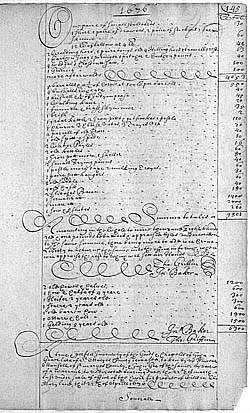 When Daniel Clocker died in 1676, he was not rich, but he had a number of possessions that probably helped make life a little more comfortable. He was also a landowner, something that would have been very unlikely had he stayed in England. Certainly Daniel was much better off than when he first arrived in Maryland as a poor servant. Not all servants were as lucky as Daniel Clocker, but for those who survived and were willing to work, Maryland provided a good opportunity to better one's position in the world. Carr, Lois Green. "Daniel Clocker's Adventure: From Servant to Freeholder." In The Human Tradition in Colonial America. Ian K. Steele and Nancy L. Rhoden, eds. "No. 1: The Human Tradition in American History"series. Wilmington: Scholarly Resources, Inc., 1999.